Sun, water and fun: the Spanish coast is the perfect place to enjoy windsurf. There are three seaboards to choose from: the Mediterranean, the Cantabrian and the Atlantic, all with an exceptional climate and a coastline which offers a whole world of possibilities. And particularly if you're one of those people who believe that the beach is not just for lying on. Every year, thousands of water sports enthusiasts from all over the world come to Spain’s beaches to practice windsurf. Spain is one of the best places for windsurfing in Europe. For this reason it is no surprise that Spain is the country to host the most world championship competitions. Its privileged natural conditions make it a real paradise for the sport. You will also find that windsurfing in Spain has many other advantages, including excellent hotel and services infrastructure and the chance to enjoy a broad range of leisure facilities and cultural attractions. If you want to live unforgettable experiences in your holiday, then make sure windsurfing in Spain figures in your travel plans. Why You'll love Wind Surfing in Spain ! You arrive at the airport in Puerto Rosario and head North to Corralejo (25 minutes), by pre arranged private transfer, or car hire. Generally it is a good idea to have car hire although this is not necessary. Fuerteventura and the Canaries are are great year around windsurf holiday destination within easy reach of the UK (around 3.5 hours flight), and a lot of other European departure points. This is one of the most wind reliable short-haul windsurf holiday destinations from March to September, but it can also be great in the winter months, just not quite as 'guaranteed' wind. A windsurf holiday to Corralejo in Fuerteventura is suitable for all levels and holiday types, including families, singles and couples, of all windsurf abilities. There is a special windsurf lagoon for beginners, a very long and stunning windsurf beach for improvers, plus some small and easy waves if you want it. This really is a great windsurf holiday location to satisfy a wide range of abilities. As with all of our location we are meticulous about which accommodation we work with, and will only suggest properties that we have personally inspected and know to be good. In Corralejo we have a superb collection of properties to include a stunning deluxe beach resort, spacious families villas and a 'cool' boutique hotel in the centre of town. A Planet windsurf holiday expert can guide you to the best property for your budget and specific requirements should you decide to contact us. Compared to the rest of the Costa Brava, the huge, fine sandy bay of Roses is very spacious, and by far the windiest spot on the Catalan coast. Located in the south of the bay of Roses, not far from the Club Mistral center, is the medieval village of Sant Marti d’Empuries with its’ famous archeological sites. From there you can reach the small village L’Escala in the southern end of the bay via a beautiful path alongside the beach. The old town, a former fishing village, offers fabulous tapas bars, restaurants, discos and nice, small boutiques. The bay of Roses has long been well-known amongst windsurfers, and now also amongst kiters. The whole region is a very interesting destination, with numerous attractions and cultural sites. Due to its’ vicintiy to the Pyrenees, rafting and canyoning trips can be offered. The message is clear: a thrilling and yet safe spot where everybody can make the most of their time and money, no matter if they are wave freaks, freestylers, freeriders, kiters or kids. A revolution, innovation, performance, new sensation - welcome to Airfoilsurfing! Planet Windsurf Holidays are one of the very first to offer course in this new sport in Golf De Roses, Spain. With just a light breeze of 8-10 knots professional instructor will teach you how to ride and fly 3 times faster than the wind. 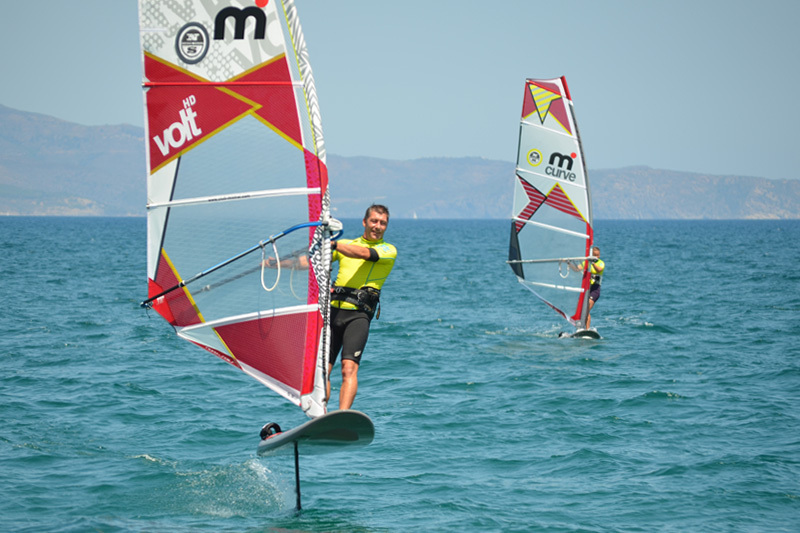 Come on a Planet Windsurf holiday to Club Golf de Roses this summer and learn a new method of windsurfing. Sotavento has long been regarded as an excellent windsurf destination with extremely reliable wind and only a short flight from the UK. The resort offers the option to either stay in the tourist resort of Costa Calma, or a little further south at the Melia Gorriones Hotel, right by one of the best kitesurf spots. Sotavento is perfect for either a deciated windsurfing holiday, or it can make for a super family holiday with many hotels offering good family facitlies. Also, The Canary Islands are viewed as a very 'safe' destination. NEW - Planet Windsurf are very excited to introduce the opening of a new windsurf centre in Southern Fuerteventura, a short walk from the also new Sercotel Beach Resort. The new centre is located at what is widely recognized as the very best windsurf spot on the island, with the cleanest wind. The cross off shore direction, with no obstruction behind, creates glassy flat water and is one for the best blasting / speed sailing spots in Europe. Costa Calma is a resort in the South East of the island of Fuerteventura in the Canary Island, around a 1 hour drive from the airport based in the North of the island. Costa Calma is home to one of the best windsurf spot in the island at Matas Blanca, here you will find amazing flat water blasting conditions the whole year around. The resort has quite a few good amenties in the terms of eating out and nightlife, but if you are looking for big nightlife then the Northern windsurf resort of Corralejo is better. A windsurf holiday to Costa Calma is best suited to either dedicated windsurfers (of water start and above level), or those travelling with non-windsurf partner or familes. The wind on this part of the island is very reliable and the windsurf spot here offers some of the cleanest flat water blasting on the whole island. In the windsurf resort of Costa Calma Planet offer either a small quiet hotel around a 5 minute drive to the windsurf centre, or the option of a 4 star beach resort a short walk to the centre. Golf De Roses has one of the best and most up to date windsurf schools in the world, set on a stunning beach in Costa Brava. Beautiful small boutique properties dotted around picturesque countryside make Golf De Roses one of the most charming locations we offer.